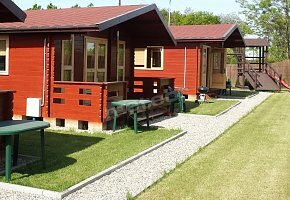 Bungalows for 4 persons. Bungalow consists of: living-room, kitchen, bathroom, bedroom. Bungalows are equipped with: fridge, cooker, TV, dishes, garden furniture. The facility is fenced. On the premises: parking lot. For children play-ground. For the active guest: water sports, water equipment, possibility of fishing. In the vicinity small eating houses. We guarantee satisfying stay and nice atmosphere. We invite you to take advantage of our offer - satisfaction guaranteed. Rooms with bathrooms. Rooms are equipped with TV. At guests' disposal: fully equipped kitchen, dining room. On the premises parking lot. Additionally on the premises place for grill. To the lake 100 m. We warmly invite you to a holiday! 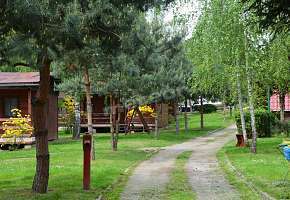 Rooms for 2 persons, with bathrooms and kitchenettes. On the premises parking lot. Additionally on the premises: gazebo, place for grill. For the active guest water equipment. To the lake 1000 m. WE INVITE YOU ALL YEAR ROUND!!! 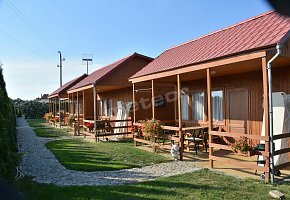 Bungalow: wooden, comfortably furnished, cottage, of high standard, stylishly designed, with kitchen, with bathroom, with terrace, with a view of the lake. Bungalow is equipped with: satellite TV. At guests' disposal: living-room. Additionally on the premises: garden furniture, place for grill. Bungalow consists of: living-room, bedroom, kitchen, bathroom. The facility is open from May to September. In the vicinity small eating houses. We warmly invite you to a holiday! Rooms: with bathrooms. At disposal: fully equipped kitchen.